Norah’s science theme this week was elephants. We always start our week off with a K-W-L chart – we list in a journal what she Knows, what she Wants to know, and later, what she has Learned. After visiting the zoo many times and going to Grant’s Farm a couple of weeks ago, Norah already knew a lot about elephants – I am always amazed at the little details she remembers. Each week there is a math page for her to do. She draws a number from a cup and then draws that many items on her paper. This was fine to do when she writing number 1-5, now that we are up to 15, she gets frustrated. She starts drawing and then has to keep going back to count how many she has. I made up some math boards. I used boards like this when I was teaching and I thought it accomplishes the same thing. I made up boards for 1-20 (she is really good at 1-to-1 correspondance, so most of this is review, but I can use the boards for Lucy, too). I shuffle them and turn them upside down and Norah picks out 2 or 3 boards and then counts that many objects onto her board. 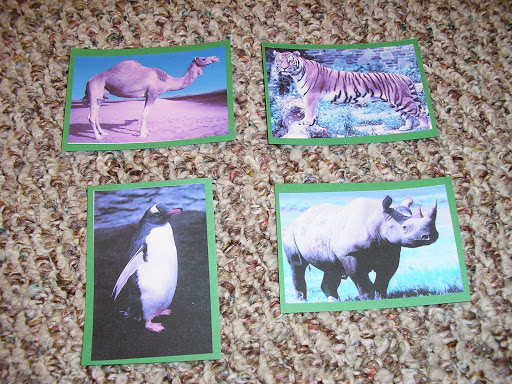 This week she used zoo animals. She is much happier to do her math this way, than the worksheet. We also played a visual memory game this week. I put out 4-5 animal pictures and she named them all for me. Then, she turned her back to me and I took one away. When she turned back around, Norah had to guess what picture was missing. I could just as easily do this with the zoo animals – we may do that next week. We read some interesting books this week. The book African Elephants talked a little about elephants being in danger because people want their tusks and because people are cutting down the trees and building homes in their natural environments. Norah was quite interested in that – all week she has asked me questions about it. Off to plan for penguins!! 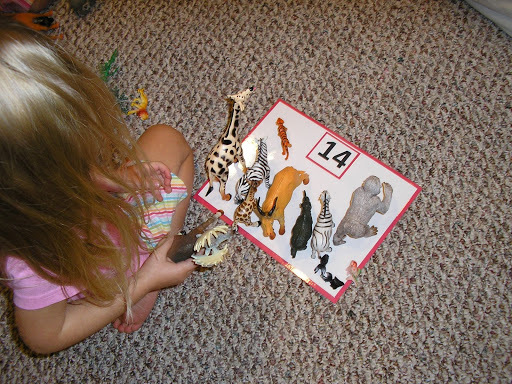 I think it is great how you gear things so well to the girl’s learning styles. I am going to e-mail you some pictures of elephants so that you can share them with Norah because we saw many when I was in Africa. Elephants are now my favorite animal! great job love your curriculum did you make it up or buy it? looks like fun! I bought a curriculum called My Father’s World, but I always add extra hands-on activities to go with each theme.